and have their opinions upon matters of importance? Through books we may, very intimately, know the wisest and best. What a privilege this is! We can all name at least one book that shaped our thoughts and filled our imagination with wonder and delight. When I was about 12 years old, I clearly remember my mom lending me her 2 tiny, leather-bound books with the thinnest pages I had ever handled, and she told me to look after them carefully. “Little Women” and “Jane Eyre” were the first ‘grown-up’ books I read and I was transformed! I sat upright (afraid I might crease the pages) and felt like a Victorian lady. And those words … they painted pictures, characters came alive, I felt every emotion, and I was transported from my ordinary world into a time gone by. What other questions could you add to this questionnaire? “The test of literature is that it must bring us truth, nobility, and beauty. Literature must be somewhat intellectual and give us truth. It must be ethical so that we are well-nourished with noble ideas. Ambleside Online provides an excellent book list for each year. 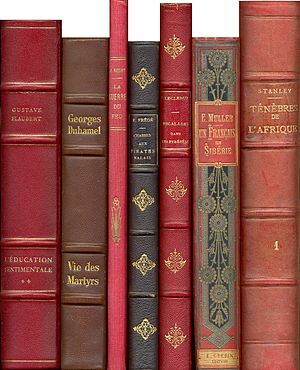 Five J’s.com gives online databases for book lists. Books make a wonderful birthday gift. I like my children to build up their own private libraries! Audio books are another great way of bringing great literature into your home. We enjoy listening to dramatized audio books in the car or while doing hand-work, arts and crafts. I love listening to audiobooks while I iron. These days, ebooks and Kindles (electronic readers) are a great way of saving space on the shelves, while still building up a collection! Read Jimmie’s article on how they use their Kindles. Check CurrClick for ebooks and downloads. Make a practice of reading to your family every day. Enjoy great books and inspire your children to love these books as friends. Lovely. Now, that may be too stingent a test for our library. Robin Hood wouldn’t likely pass nor likely these beginning chapters of Robinson Crusoe, but my kids have learned a lot about virtue through the escapades and folly of characters’ lives as well. But that list of questions would definitely leave out many worthless and tasteless novels. It is good to have high standards in literature. How dear that your kids are building their own personal libraries. My boys will often ask longingly, “Is this book for me forever, to keep?” Love that relationship with books. Nads, I must just add another resource for good books which you can find by google-ing “1000 good books” the nice thing about this list is that it is age/grade divided. We have it printed out and use it at the library as a guide. Lovely post! Thanks for sharing how you determine what a good book sounds like! I came in from Homeschool Highlights, and I’m definitely getting some great food for thought from your post! And I heartily second the 1000 good books list. I’m working on cross referencing that list with the suggestions from The Well-Trained Mind, and then I just need to figure out how to take that & a list of the books I’ve already got with me when we go to the thrift shops… I’m frequently amazed at the classics they have at the thrift shops, for hardly any money at all! What a great list of resources, Nadene. There’s also a booklist at Excellence In Literature (http://ExcellenceInLiterature.com, naturally!). One thing I’d add is that a great book is usually unforgettable. Something about it will stick, and sometimes many years after reading a book, you’ll encounter something that brings back the story, along with the emotions it evoked. What a delight!